A bride was told to break a leg on her big day – but it came true when she tripped on her own wedding dress. Nichola Newton, 29, fractured her tibia when she took a tumble on the dancefloor but carried on dancing into the night with the help of a wheelchair. 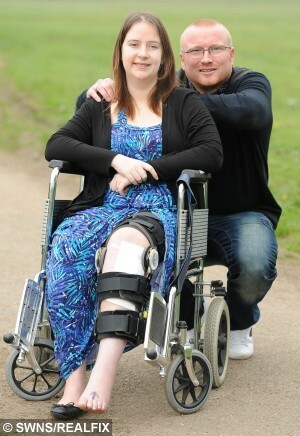 She and new husband Jonny, 33, were forced to cancel their dream honeymoon after she needed an urgent operation to have pins and a plate inserted into her left leg. Nichola said: “Everything had gone as I’d dreamed, the weather was beautiful and we had shared a memorable day with my family and friends. 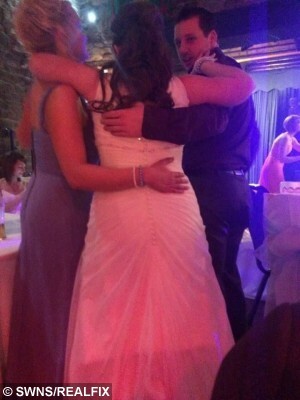 “We had cut the wedding cake and had the first dance together at around 9.30pm. “My feet were killing me so I kicked off my shoes and decided to have a dance. “It certainly wasn’t the best decision I’ve ever made. Sales manager Nichola had enjoyed ‘a perfect wedding day’ getting hitched to her partner of 10-years, before their Park Hall Hotel in Chorley, Lancs., resulted in chaos. Having tripped on the dancefloor, she carried on with the help of a few jagerbombs, unaware how serious her injuries were. She said: “I was uncomfortable but didn’t realise how serious it was. I was given a wheelchair and took it on the dancefloor and everyone danced around me. “I also had one or two extra Jagerbombs to numb the pain. 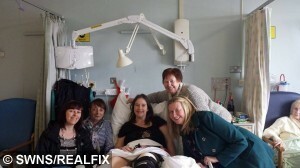 Nichola ended up spending 12 days in hospital while surgeons inserted a plate and four screws into her leg and put it in cast. But she was supposed to be sunning herself on a beach in Cancun, Mexico, and the newlyweds almost lost the holiday completely – until a travel agent heard what had happened and intervened. Marina Marsh, manager of the The Holiday Shop, Feniscowles, Lancs., said: “They were told nothing could be done and would lose all the money paid due to the fact that they were travelling two days later. 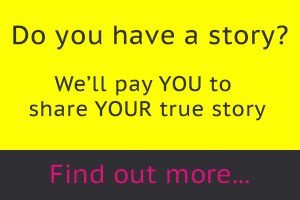 “Eventually we found someone at Thomas Cook who understood and we managed to change the holiday over to September. Nichola, who is now recuperating at home, is looking on the bright side and is starting to see the funny side of what happened. Read about another wedding dancefloor disaster here!